Green energy: Sean Kelly of HUMAN Healthy Markets. Now in its fifth year of business, the Arizona-based franchise, which helps seniors find assisted-living facilities, has 125 units across the U.S. and added 60 units in 2014 alone. It’s a meteoric rise for a franchise system. But while growth is positive when it comes to the economy in general, in franchising it can come with extra baggage. A new brand that doesn’t grow quickly and doesn’t generate enough buzz can be seen as a bad bet. But one that grows too quickly, adding dozens or hundreds of units out of the gate, could be a red flag that the founders are more interested in pocketing franchise fees than in helping their franchisees get off the ground and maintain successful businesses. Then there are the systems like CarePatrol, which have found the sweet spot between rapid growth and smart growth. The key to making it happen, and to not being overwhelmed by so many new franchisees, is CarePatrol’s training program. Franchisees are trained at corporate headquarters for a week and in their home territory for at least a week before undergoing a 16-week intensive coaching program. That strong, organic growth has meant that Engineering for Kids—which provides STEM (science, technology, engineering and mathematics) enrichment after school, at parties and during camps—has had to evolve its business more quickly than franchises that spend years perfecting their systems before expanding. This has meant broadening services based on customer demand. The company’s support staff has grown rapidly, too. At launch, the franchise was managed by the founder, Dori Roberts, and two part-time franchisee support coaches. Since then, it has added three vice presidents and a manager of curriculum development, among other positions. It has also developed a huge library of training videos. “We’ll always be adapting,” Cavanaugh says. Also seeing massive organic growth is Pure Barre, an exercise and retail boutique concept that has opened 265 units since it began franchising in 2009. 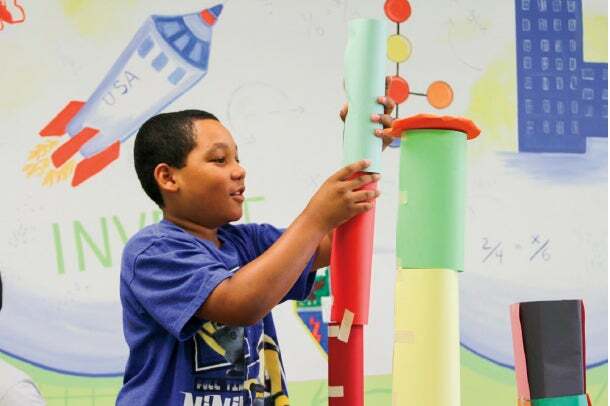 A solid building plan: Engineering for Kids. But unlike Engineering for Kids, Pure Barre’s growth wasn’t a complete surprise. In 2012, founder Carrie Dorr decided to step back from the business and teamed with a private equity firm, WJ Partners, which brought in a talented executive staff that included Evans. That group of franchise professionals was able to implement a growth strategy that has helped Pure Barre maintain its position as the first barre workout franchise in many markets, and the largest nationally. Connecticut-based Green Home Solutions, which launched a year and a half ago with just three people, is already up to 22 corporate employees and 150 franchisees. Chief cultural officer Russ Weldon believes the system could hit 500 by the end of 2015. The other reason growth is so fast—and so important—for Green Home is that the types of services it offers are just gaining traction among customers. Getting first-mover advantage and establishing itself as the most trusted name in the industry is important to the company, which anticipates that many more players will get into the field. That means staying on top of the natural solutions that are coming onto the market—such as a new treatment for pet odor—and deploying them quickly. “We’re in the right place at the right time,” Antolini says, pointing out that green services are an emerging market that is the next step for people who are already trying to avoid pesticides and toxic chemicals in their food. HUMAN Healthy Markets is another company banking on consumers’ desire for safe, healthy alternatives. Beginning in 2008 licensing vending machines, it became a franchise two and a half years ago. The company now places vending machines stocked with healthful options in schools and health clubs but devotes most of its efforts to putting small, self-serve markets in office buildings and corporate environments. The system, which counts more than 145 franchisees, with 50-plus markets and more than a thousand vending machines, is adding four franchisees per month. Though growth has been steady, it has taken co-founder Sean Kelly five years to figure out his emerging industry and to refine his business model and growth strategy. Now, with all the pieces in place, he expects even more robust expansion. But Kelly has come to realize that the type of franchisee he recruits needs to change. In the past, about 80 percent of HUMAN franchisees have been part time, using the vending machines as supplemental income. But once franchisees reach 20 or so machines and markets, they typically don’t have the capital for growth, or time to service all their units. Kelly hopes to switch that ratio over time, continuing to sign up about four franchisees per month, but with 80 percent committed to HUMAN full time.